Use the Append transformation to create a single target by appending (concatenating) two or more sources. Note: You cannot append a table to itself. You want to combine data from several source tables into a single target table. Select and drag an Append transformation from the Transformations tree. Then, drop it in the empty job on the Diagram tab in the Job Editor window. Select and drag the source tables from the Inventory tree. Then, drop them before the Append transformation on the Diagram tab. Drag the cursor from the source tables to the input port of the Append transformation. This action connects the sources to the transformation. Because you want to have a permanent target table to contain the output for the transformation, right-click the temporary work table attached to the transformation and click Replace in the pop-up menu. Then, use the Table Selector window to select the target table for the job. 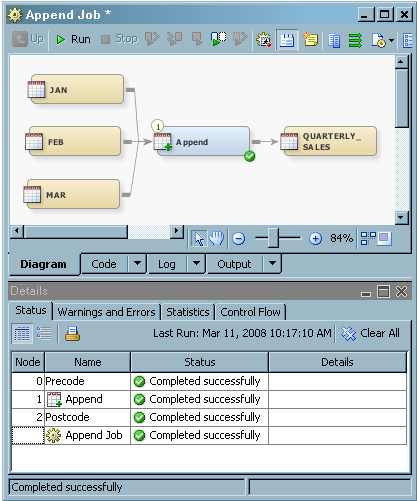 The following display shows a sample process flow diagram for a job that contains the Append transformation. The source tables for the sample job are named Jan, Feb, and Mar. 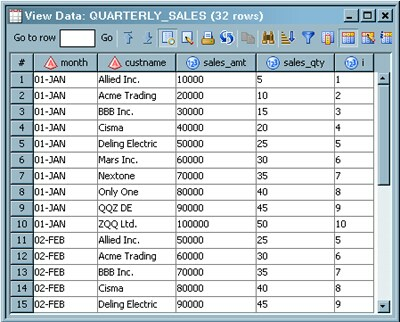 The target table for the sample job is named QUARTERLY_SALES. It contains sales information for specific customers for the months of January, February, and March. Note that the first ten rows in the sample target table display data from the Jan table. The next five rows display data from the Feb table. The remaining rows display the rest of the data from the source tables.